This new bridge club has been in operation since August 1st, 2017. 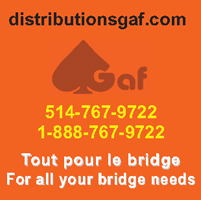 Dominique Dagenais, Françoise Frenette, and Susan Martin invite you to their bridge club, in Rosemère. You are all very welcome. Wednesday : 13h00 - Supervised Duplicata. Thursday : 13h00 - Duplicata ACBL - Section A, Section 0-300 also.